For almost four hours the drama keeps audiences on the edge of their seats with few letdowns. There are unforgettable climaxes: 1) Scarlett shooting the Yankee "deserter" ("deserter" is a concession to Northern protest: in the book he is one of Sherman's raiders) ; 2) the scene of mass desolation as the quietly weeping people of Atlanta read the casualty lists after Gettysburg. Audiences are jerked out of their seats when the mood of defeat is smashed triumphantly as a band bursts into Dixie. By great cinema craft, it is the first time the whole of Dixie is heard in the picture. There are few comic concessions, but there is sly humor in Prissy 's (Butterfly McQueen) singing of Jes' a Few Mo' Days, Ter Tote de Weery Load. There is -sumptuous satire in the sets of the barbaric mansion, the realization of all Scarlett's ideals, in which Rhett and Scar lett enshrine their garish passion. In contrast, sudden lyrical shots lighten the cinemagnificence. 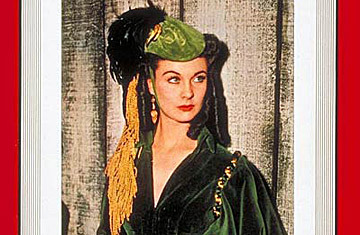 Technicolor (using a new process) has never been used with more effective restraint than in Gone With the Wind. Exquisite shot: Gerald O'Hara silhouetted beside Scarlett against the eve ning sky at Tara while he propounds to her the meaning of the one thing she has left when everything else is wrecked  the red earth of Tara. Though delighted Georgians clapped, cheered, whistled and wept at the historical sequences, Northerners might not. There had been protests from daughters of G. A. R. veterans. But David Selznick was not worried. The advantage of film ing two great legends in one picture was that he had two great pictures  a sure fire Rebel-rouser for the South, a sure fire love story for the rest of the country. After the Hollywood press preview, Producer Selznick stood in the lobby, scanning the faces of the "toughest audience in the world" with as much eager ness as any tyro at his own first play. Most of them were dabbing their eyes, and for those who were not the impact of the picture was too powerful to talk about. Selznick got few comments. Perhaps he was unduly worried about the $5,000,000 the picture has to make before it begins to earn any profits at all. Perhaps he was worrying about something else. Night be fore, Producer Selznick made a confession that had the ring of truth. Said he of Gone With the Wind: "At noon I think it's divine, at midnight I think it's lousy. Sometimes I think it's the greatest picture ever made. But if it's only a great picture, I'll still be satisfied."